The suspect in the abduction and murder of a young student left a note detailing where he had dumped her body after he strangled her. Father-of-two Mark Hennessy was shot dead on Sunday night after being confronted by an armed Garda detective. It followed a two-day manhunt for the married man and the Nissan SUV he was driving, which was used in the abduction of Jastine Valdez (24). The Irish Independent can reveal that tragic Ms Valdez was murdered near the scene where her body was dumped. Investigators are now searching their DNA database to see if Hennessy is linked to any other unsolved crimes. Despite the suspect in her disappearance being found and killed on Sunday night, it was not until shortly after 3pm yesterday that gardaí discovered the body of Ms Valdez. It has now emerged the murder suspect left a note covered in blood in his car in which he told gardaí he had dumped the Filipino woman's remains in the Puck's Castle Lane area of Rathmichael in south Dublin. Gardaí are also investigating reports that Hennessy was socialising in a pub in the Ballybrack area on Saturday night. It is believed he went drinking just hours after Ms Valdez's abduction. 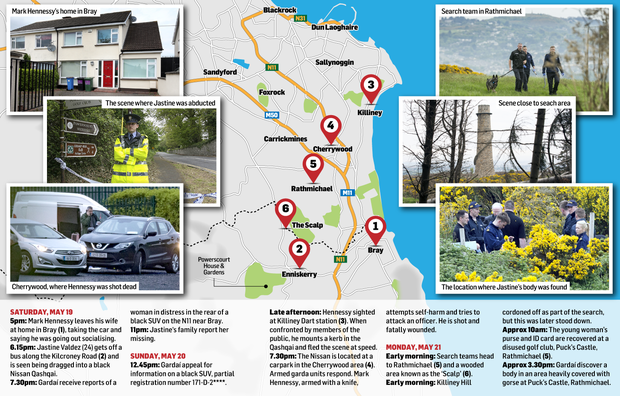 Following a large-scale search operation involving gardaí and the Defence Forces, her body was found in gorse in the Rathmichael area of south Dublin, almost 48 hours after being abducted. Deputy State Pathologist Linda Mulligan was due at the scene last night to carry out a preliminary examination of the body and formal identification was due to take place. Gardaí have not yet established a connection between Hennessy and Ms Valdez and investigators at this stage believe the abduction was a random attack. Witnesses - who included a 12-year-boy - reported seeing a woman being punched by a male and then forced into a black Nissan Qashqai along the Kilcroney Road, Enniskerry, at 6.15pm on Saturday. Later that evening, the family of Ms Valdez reported her missing and gardaí established a link between the reported abduction and the young woman's disappearance. A number of appeals were issued on Sunday, and a Garda manhunt resulted in Hennessy being found at a car park in Cherrywood, south Dublin. It is understood that the murder suspect was self-harming and also attempted to attack a garda before he was shot by an armed detective from a south Dublin station. He was struck in the arm and head and was pronounced dead at the scene a short time later. A Gsoc investigation has been launched into this incident, and the garda in question has been receiving support from colleagues. The experienced detective, who is originally from Wexford, has been described as a highly respected officer who has never faced any disciplinary issues. It can also be revealed that Hennessy appeared in court just last Monday to face a number of charges relating to drink driving and leaving the scene of an accident. This related to an incident in Bray in September of last year, when he crashed into another motorist. He was due to re-appear in Bray district court on June 11 in relation to the matter. The father-of-two, who only had a second child last September, was not known to gardaí in recent years for any serious criminal behaviour. However, he had three previous convictions dating back to his early 20s. In 1999, he was convicted of simple drugs possession after being found with IR£100 worth of cannabis in St Stephen's Green. A year later, in September 2000, he was charged with a public order offence in Rathmines, Dublin. During that incident he head-butted another punter at a pub. He was later convicted of threatening and abusive behaviour as well as being drunk and disorderly and was fined €250. A senior source last night told the Irish Independent that gardaí have nothing to connect Ms Valdez and the suspect. "There is no obvious connection, even after thorough inquiries by gardaí, and at this stage gardaí still believe it was a random abduction," the source said. In a further appeal yesterday, a spokesman said: "Gardaí would like to appeal for anyone who was in the vicinity of Puck's Castle Lane, Murphy's Lane or using Carrickgollogan Forest Recreation Area, or anyone who was in the vicinity of the Lead Mines in Kilternan from Saturday, May 19, at 6pm to Sunday, May 20, at 8pm who may have seen anything suspicious and, in particular, Black Nissan Qashqai 171 D 20419." From early yesterday morning, members of the Garda divisional search team, assisted by 60 troops from the Defence Forces, carried out a significant operation along the Puck's Castle Lane and nearby golf course in an attempt to locate Ms Valdez. A number of routes along the walkway were sealed-off by gardaí throughout the day as the searches were carried out. Yesterday morning, members of the Garda Divisional Search Team had recovered a purse belonging to her. A coat was also recovered, and will be forensically examined.